The drag racing scene was at its peak in the 1960s with almost every major automaker involved one way or the other. Henry Ford II loved racing too, especially since winning at the track translated into better sales, and pumped a lot of cash into FoMoCo’s racing department. An Indy 500 engine project resulted in a win at the Brickyard in 1965, while the Ford GT went on to win the 24 Hours of Le Mans a year later. Ford was dominating NASCAR with the Galaxie, a full-size that was also competitive at the drag strip thanks to the race-spec, 427 cubic-inch V8 known as the “high-riser” and the more exotic, single-overhead-cam V8, called the “Cammer.” When the latter was banned from NASCAR in 1964, Ford took it to the drag strip for the new Factory Experimental (FX) class. A catch-all category created to keep up with the growing number of factory super stock vehicles coming from GM and Mopar, the FX category brought solid front axles, acid-dipped body shells, and altered wheelbases to the race track. Ford knew it couldn’t compete with the Galaxie against the new wave of Plymouth and Dodge race cars, so it created a run of FX-spec Mustangs. After a prototype was put together in Dearborn, Ford commissioned Holman-Moody to build 15 A/FX cars. FoMoCo shipped the fastback models without powertrains, hoods, fenders, and doors to Charlotte, North Carolina, where Holman-Moody stripped the chassis of all stock suspension components. The modifications were quite radical and included reshaped rear wheel wells, quarter panels, and floorboard, all redone to allow the rear axle to slide forward three inches for improved transfer during launches. A custom cross-member was added to the rear axle to serve as a mounting point for traction bars, with additional extensions fitted as mounting points for an extra set of shock absorbers. In front of the axle, mounting braces were drilled for five location points, allowing the cars to be set up for various traction conditions at the race track. 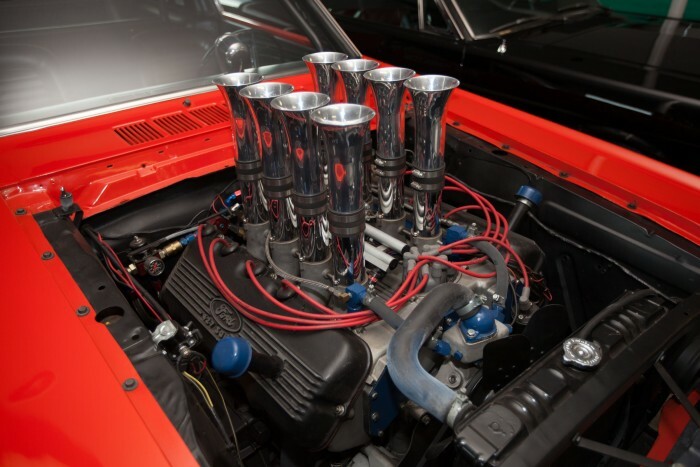 Up front, the shock towers were modified to make room for the big-block V8 engine. Steel plates were welded into the upper third of each opening so that brackets were attached to supply mounting points for the shorter upper A-arms. The stock coil springs were replaced by two-leaf flat springs that worked like torsion bars. In place of the missing steel fenders, doors, and engine hood, Holman-Moody added fiberglass parts, which, alongside the plexiglass windows, helped cut weight down. Magnum wheels were fitted at all corners and wrapped in 10-inch M+H slick tires. Of the 15 units built, only seven A/FX Mustangs were originally equipped with the overhead-cam 427 V8, as they were in short supply in 1965. The other eight received the “high-riser” V8, but most were later refitted with the “Cammer” engine once it became available. For all these modifications, Holman-Moody received the modern day equivalent of $1,000,000. The A/FX had a successful racing season in 1965, with Gaspar “Gas” Ronda setting a NHRA record in his altered Mustang by running the quarter-mile in 10.43 seconds at 134 mph. 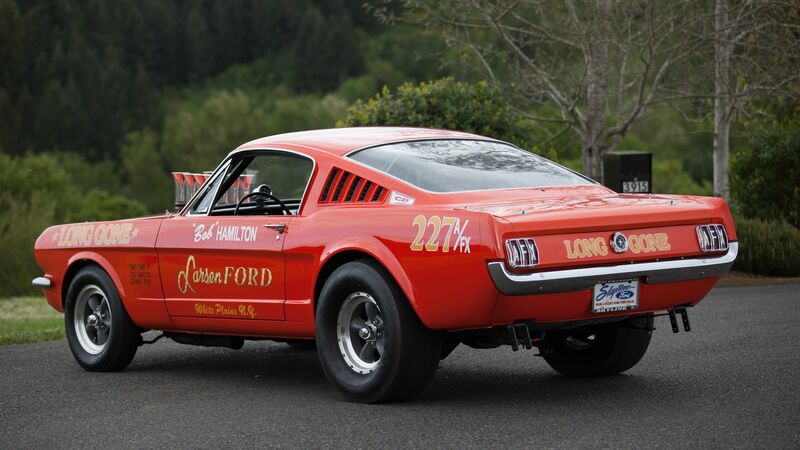 However, as the NHRA modified the rules for altered-wheelbase race cars in 1966, most of the A/FX Mustangs were returned to Holman-Moody to have their suspensions relocated to the stock position. Today, the A/FX is a rare gem, with only five known to still exist. Owned by collectors and former race car drivers, A/FX models don’t change hands very often. But when one of these drag racers goes on sale, it usually gets a lot of attention. These cars are estimated to worth between $500,000 to $750,000 nowadays, which is quite a lot of dough given that very few Mustangs have been auction for more than that. Is the A/FX Mustang the most badass Mustang ever built? Does it put the Cobra Jet Mustang in its place? Comment your thoughts below!